The road trip is over and we’re back home now. It’s never easy coming down from that awesome vacation high, but it was quickly followed by an anniversary high. 2 years. We’ve been married 2 years! Without a doubt, those were the fastest 2 years of my life. A lot happened and a lot changed in just 24 months’ time. And this year, we’re coming up on 10 years of knowing each other. Just. Whoa. We timed our road trip perfectly, I think. 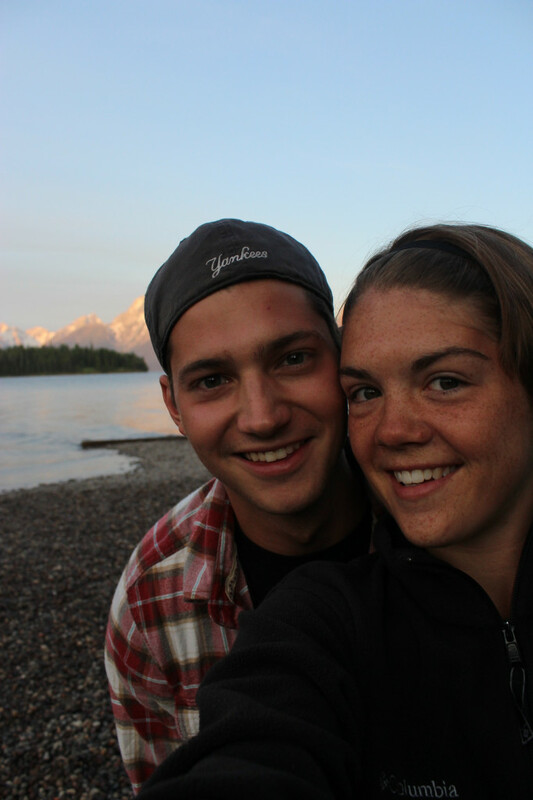 It turned out to be a 2nd honeymoon right before our 2nd anniversary – 17 days of driving, camping, and wilderness alone time. We saw new things together, learned more about each other, and faced plenty of challenges along the way. Flat tire. Gravel roads. Nowhere to camp. Nowhere to eat. 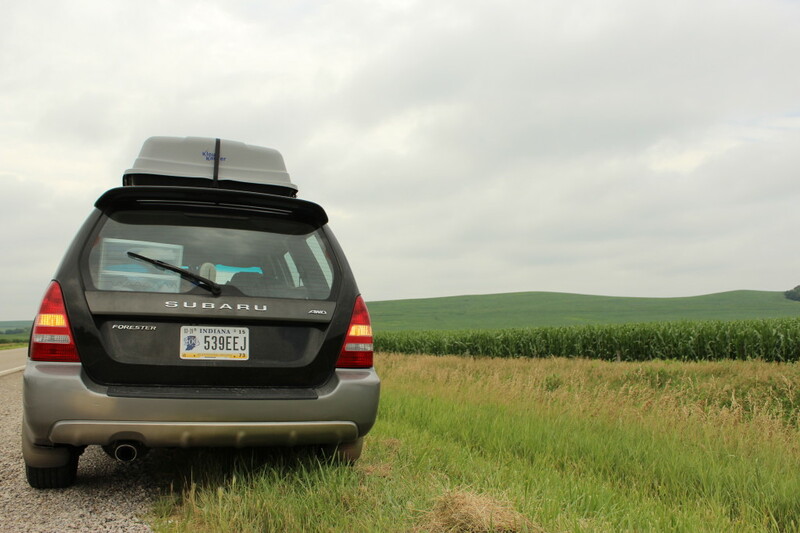 Lost without cell phone signal – thank God for the Atlas. But my goodness, did we have fun. It goes without saying that food was a big part of our road trip; food is a big part of our relationship. It’s been that way since we were in college. We learned to cook together then and we’re still learning now. If you ask me, that’s one of the best things about food – you are always learning, trying, being surprised – just like being in love. No one could ever know all that there is to know about food and I know I’ll never know everything about Clark. That just means every day is an opportunity to learn learn something new and exciting! Food and love are two things that can never be boring if you’re doing them right. I promised when I was raving to you about Montana that a food recap would be forthcoming. The food may not have been quite as big of a deal as the rivers, canyons, and wildlife that we saw, but still – what kind of food blogger would I be if I didn’t tell you all about what we ate? As I was thinking about each restaurant that I wanted to include in this post, I noticed a theme emerging. The best meals were those that we didn’t expect. They surprised us. When we needed food the most, these places saved the day. We felt nourished, renewed, and ready for more adventuring. We could talk about the day ahead of us or everything we’d seen so far. 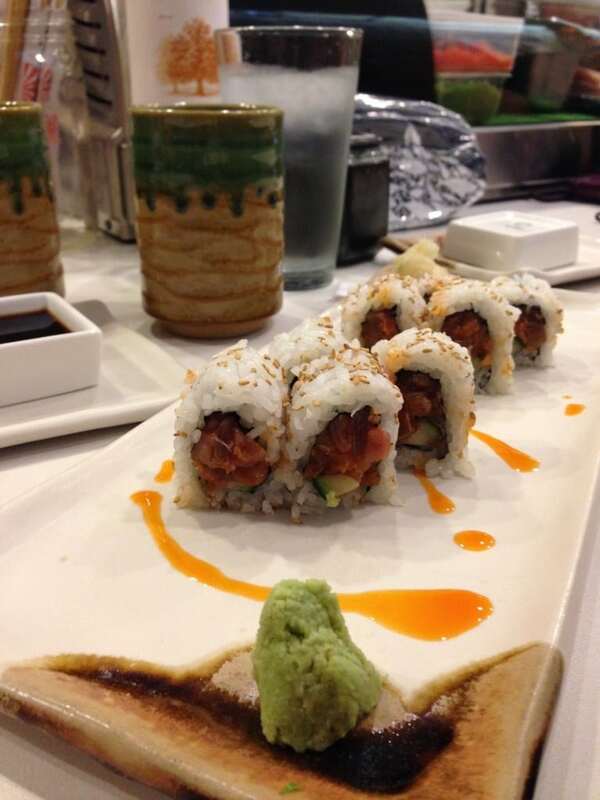 We would trade bites and argue over who ordered the better dish, or just order one dish and share it all. Sometimes we would borrow WiFi, lay out the atlas, and figure out our plan of attack for the next day. You would think we’d be tired of each other after spending days together in the car, but nope. 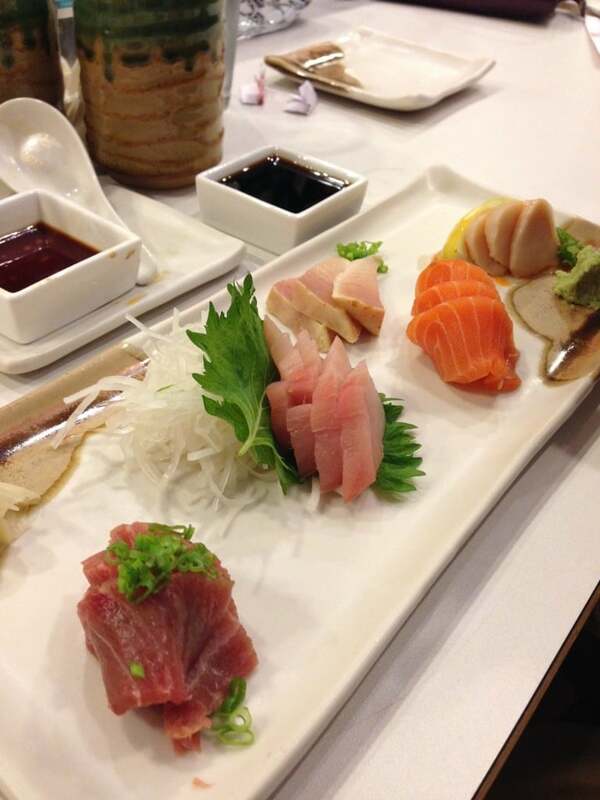 We don’t go out to eat very often so it feels like such a treat whenever we do. It’s nice to let someone else do the cooking for a change and just be present with your hot date. 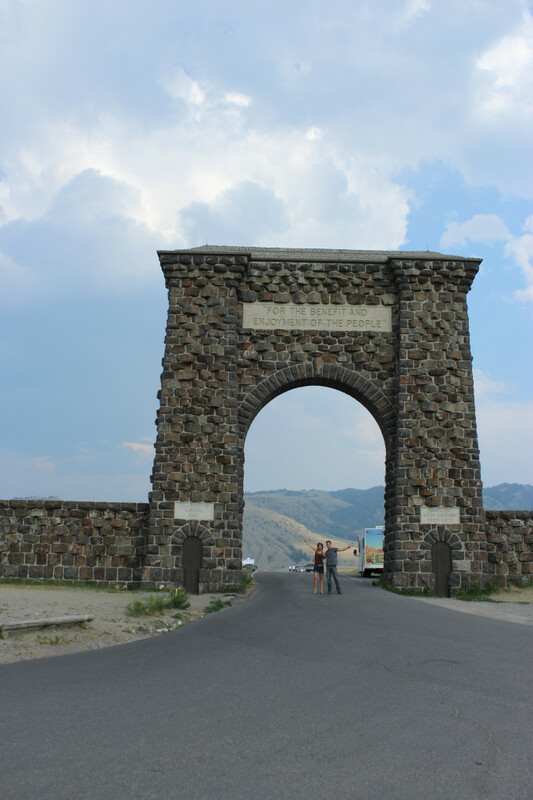 Red Tractor Pizza, Bozeman, MT – We spent a long day in Yellowstone, driving around, getting out of the car to sightsee and hike, and sitting in summer tourist traffic. A long, 10-hour day. The quick dip in frigid Yellowstone Lake was a major highlight, but by the time we left the park, we were more than hungry. Our snacks had dwindled to granola bars and we had already gotten sick of them by this point. There is virtually no food in the park unless you feel like eating at one of the rustic grilles that offer fresh-off-the-Sysco-truck meals. I’m not one to waste a meal on subpar food, so we decided to starve until we got to Bozeman. After some brief Yelp research, I decided on a seemingly-good pizza place and we headed that direction. Then fate stepped in. We saw Red Tractor Pizza and a sidewalk sign: “gluten-free, organic…” Clark locked up the brakes and we all but ran inside. They say their pizza is “New York-style,” but in all honesty, it trumped any pizza I ever had in New York. Hands down. 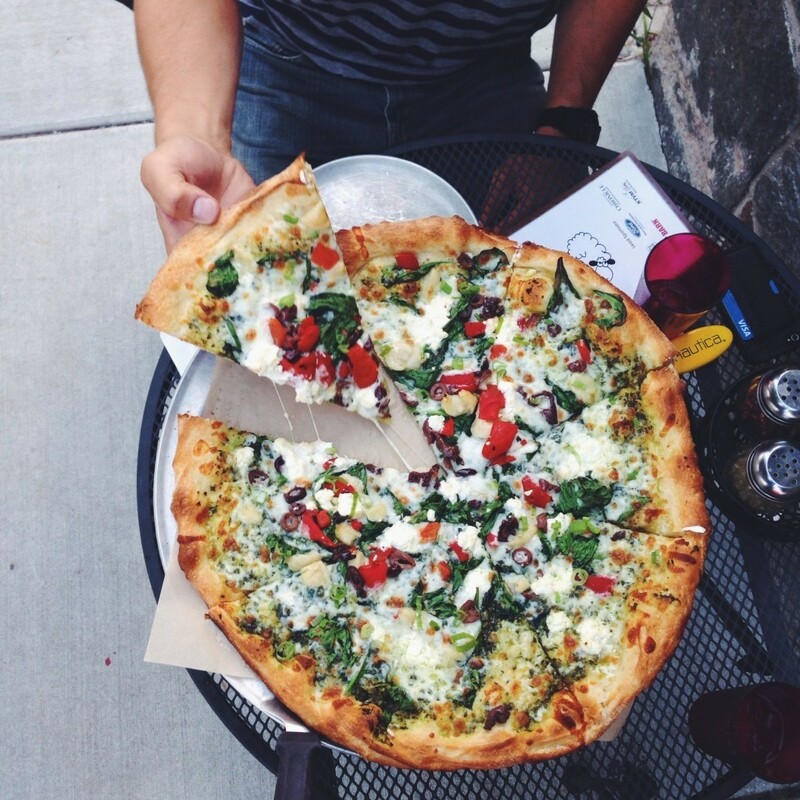 Clark has had multiple dreams about this pizza since that night – it’s that good. I think I would make the drive back to Bozeman just to eat that meal all over again. We went for The Ragazza, which is topped with basil pesto, mozzarella, organic chevre, baby spinach, roasted garlic, kalamata olives, and roasted red bell peppers. But when – not if – you go, good luck choosing what pie to order. 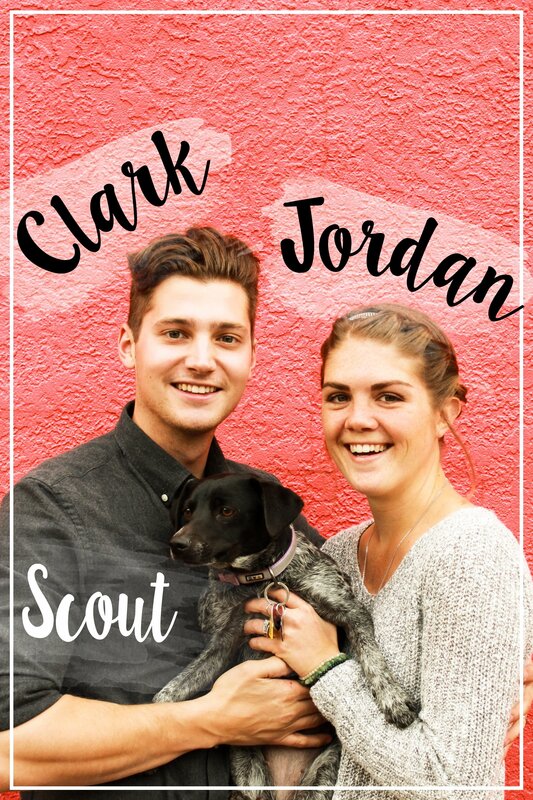 Montana Fish Company, Bozeman, MT – If you know Clark, you know that Clark’s favorite food is tuna. Not the kind that comes in a can. The kind that comes fresh off the fishing boat and was still swimming 12 hours ago. Enter Montana Fish Company. A few young, scruffy white guys were running the joint – sipping Sierra Nevadas and cutting up with their 8-ish customers at the sashimi bar. Hands down, the best fish either of us had ever eaten. EVER. So fresh, so tender, so colorful. I want to go back to that moment and live in it forever. As the night wore on, it got better and better. The sushi chefs offered us shots of Fernet Branca – “an industry thing” – according to them. And naturally, we couldn’t say no. 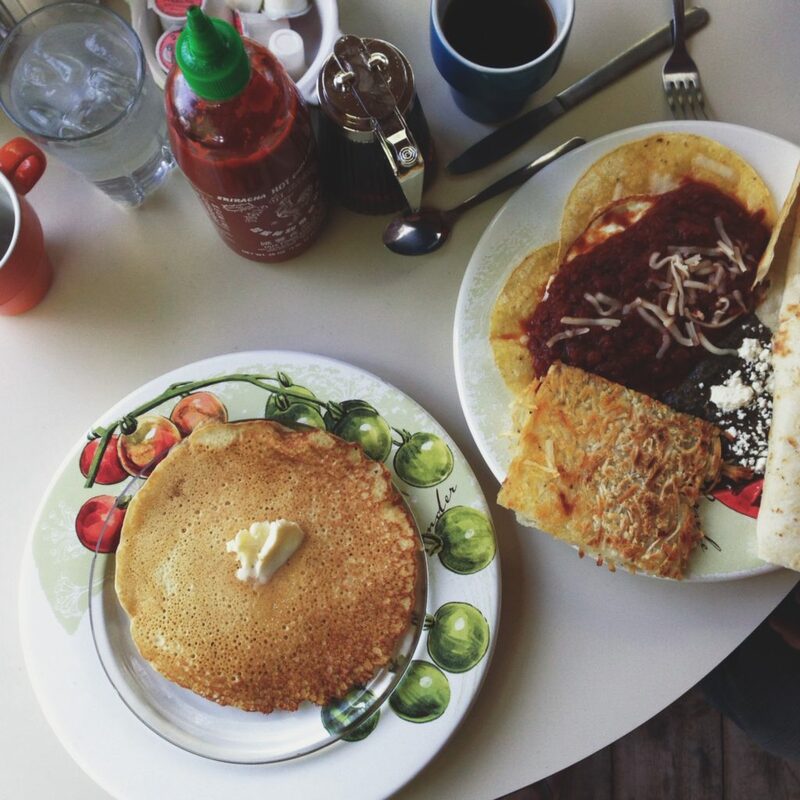 Mom’s Cafe, Dubois, WY – This breakfast. This morning. After that night. The night before we ate at Mom’s, we made the mistake of passing up a few campgrounds and thinking we could make it a little further before dark. Without cell service, we had no idea what we were getting ourselves into. So we kept driving, and driving, and driving. No campgrounds in sight. We rolled into Dubois completely exhausted and quite hungry. All 3 of their sketchy motels had “No Vacancy” signs lit up in red, and I wouldn’t have paid money to sleep in any of them anyway. And thus, car camp number 1 occurred out of necessity. As the amateurs that we were [we’re now pro-status car campers], we leaned back the seats and attempted to sleep that way. Although it was better than our first night in Iowa, we both woke up groggy, with all kinds of sore parts, and ready for coffee. As we started to leave the parking lot, a cyclist pointed at our car and walked our way. “You’ve got a flat there.” Oh, goody. I can’t think of anything I’d rather hear at 7am. And the best part? 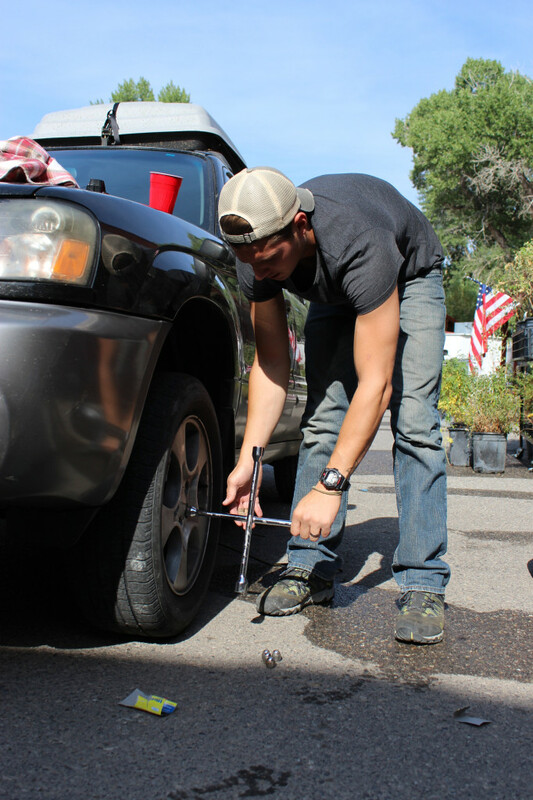 We had everything necessary to change out the tire… except for a tire iron. Womp womp. None of the auto stores opened up 9am. Even better. While we waited for Dubois to wake up, we decided coffee was the best way to pass the time. So we walked over to Mom’s and sat down outside, 12 feet away from a soothing mountain stream. It was the definition of a mom-and-pop place – a small but cozy restaurant, everything is homemade, and the servers are happy to strike up a conversation. The owner was one of our waiters – he brought some of our food out, refilled our coffee, and made sure everything was good. It was. Huevos rancheros and 1 huge pancake hit the spot, and then some. Note to self: Always listen to the kind, adorable Thai lady. No soy sauce, no salt, no pepper necessary. These people know how to cook. Fresh ingredients, real flavors, slow-building heat from natural spices. 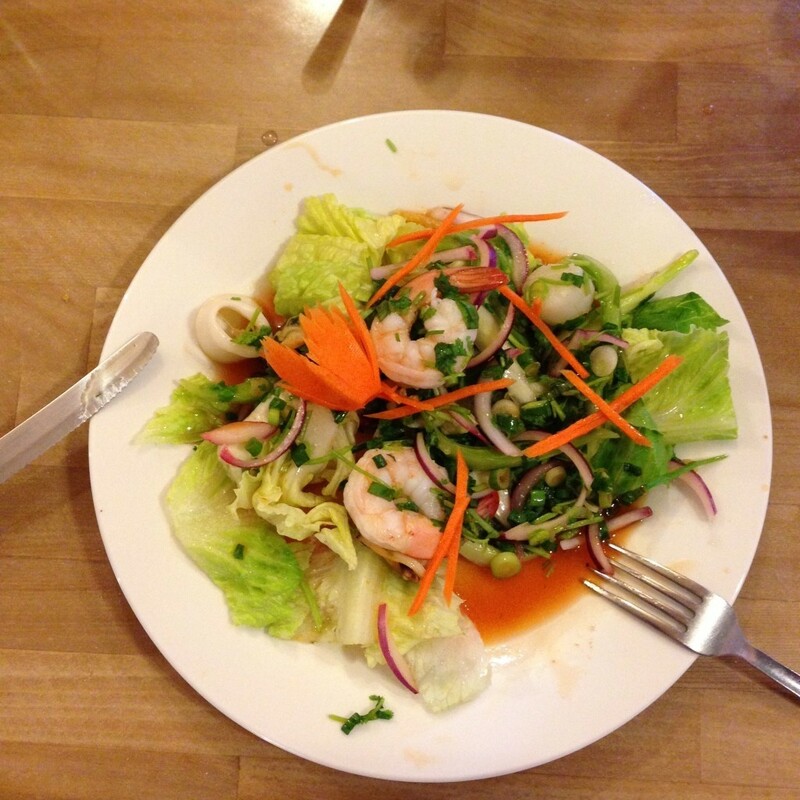 I would never have expected to experience authentic Thai food in America’s least populated state, but boy, was I wrong! The Skillet Cafe, Iowa – Our first night was not the most pleasant. 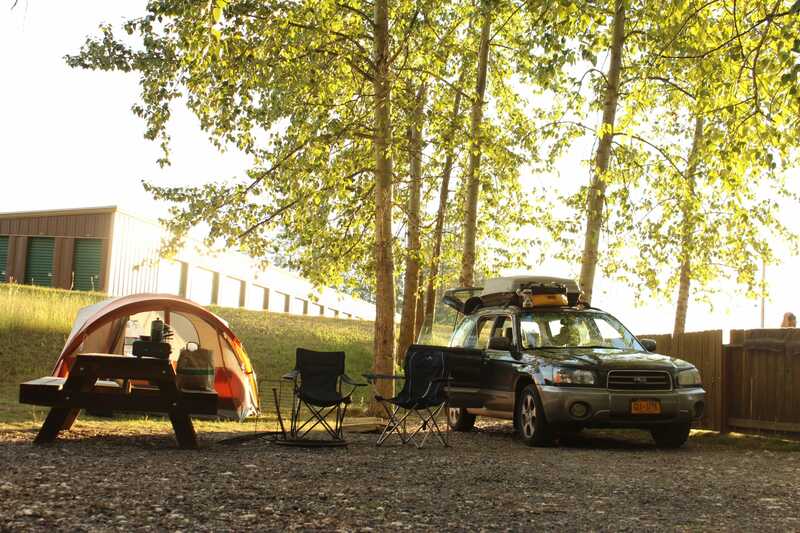 We rolled into a riverside campground as dark was quickly approaching and immediately started setting up. Cue bug infestation. We were running back and forth to the car, slapping ourselves on the backs, and hopping around like idiots… and we still got peppered with mosquito bites. After a damp, chilly, sleepless night, we both woke up feeling like zombies. Now that my mouth is watering and I’m daydreaming about being back out west, I think that just about covers it. These weren’t the only places where we ate, but they were by far the most impressive and memorable and I would recommend them a thousand times over. If you’re planning to travel out west, I suggest you make it a point to stop in at any (or all) of these restaurants. If you’re planning a road trip, I’ve compiled a comprehensive list of what you can expect along the way. Oh, and I apologize in advance for the photo overload below. 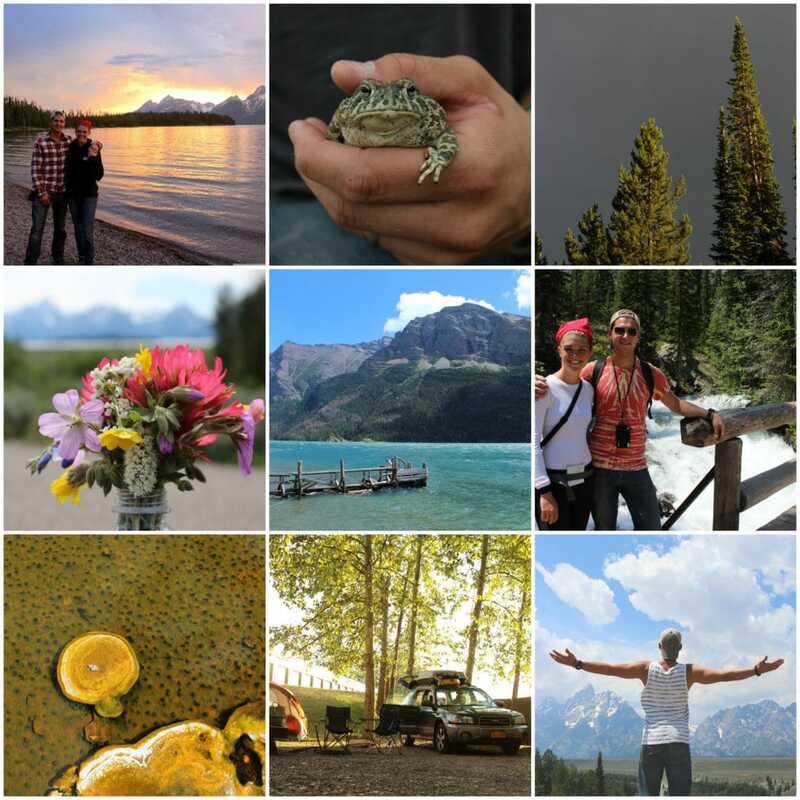 If you don’t like to see awesome mountains, random animals, and goofy faces – abandon ship now! 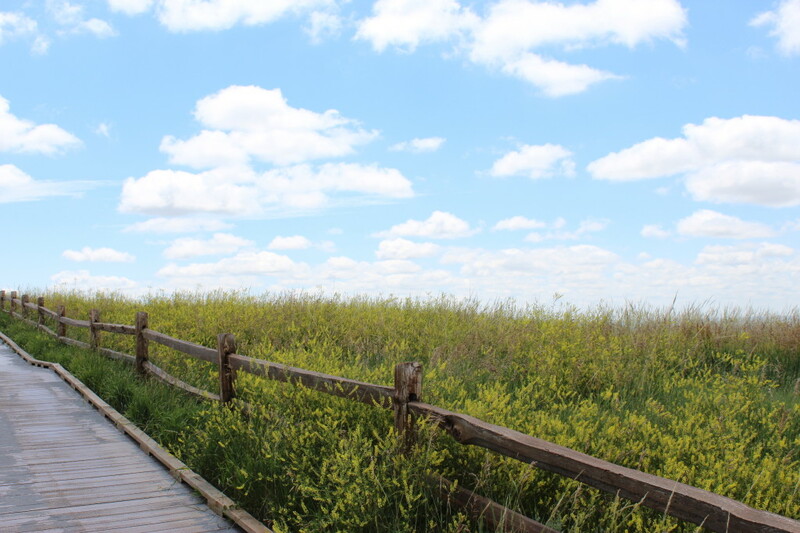 Wide open spaces in the Badlands. 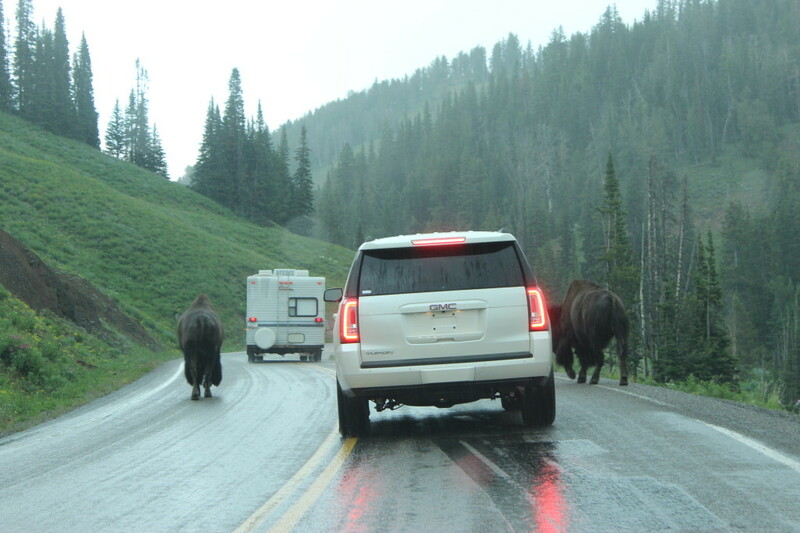 After 2 days of exploring in Yellowstone, we were Bozeman-bound. 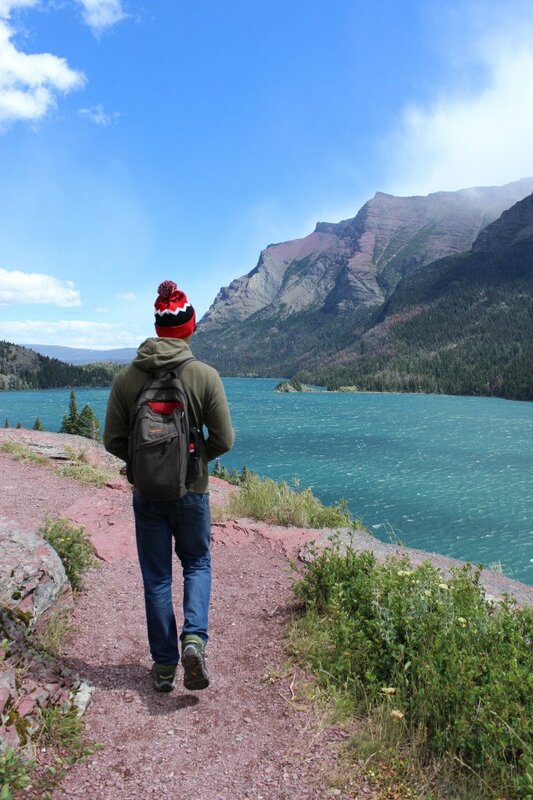 Clark taking the lead on our hike around St. Mary’s Lake in Glacier National Park. 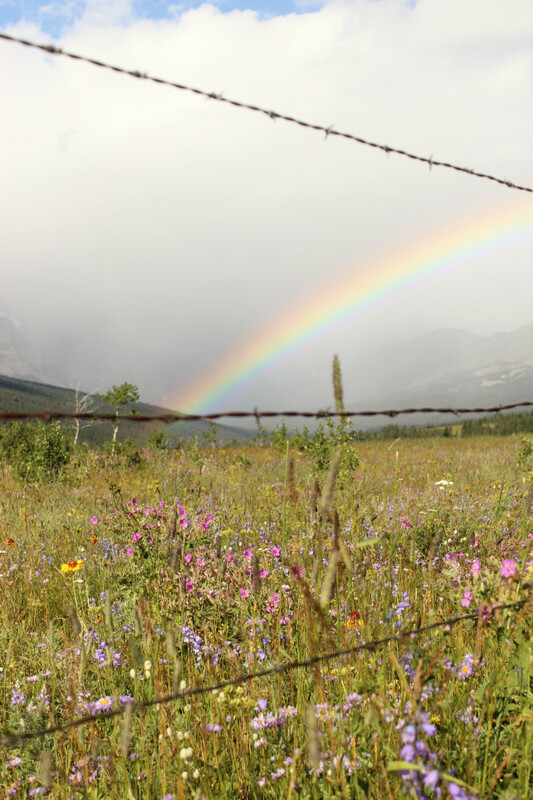 Wildflowers and a rainbow welcomed us into Glacier National Park on day 2. 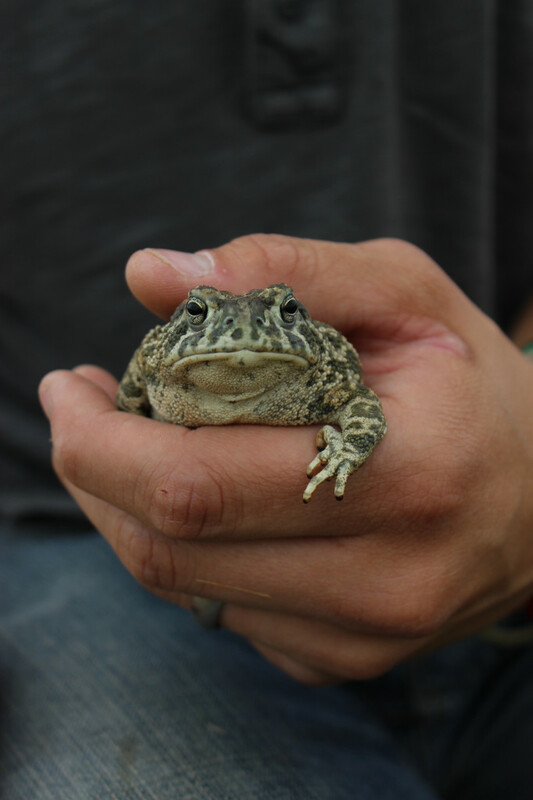 Clark made a friend with this frog who slept under our tent in the Badlands. 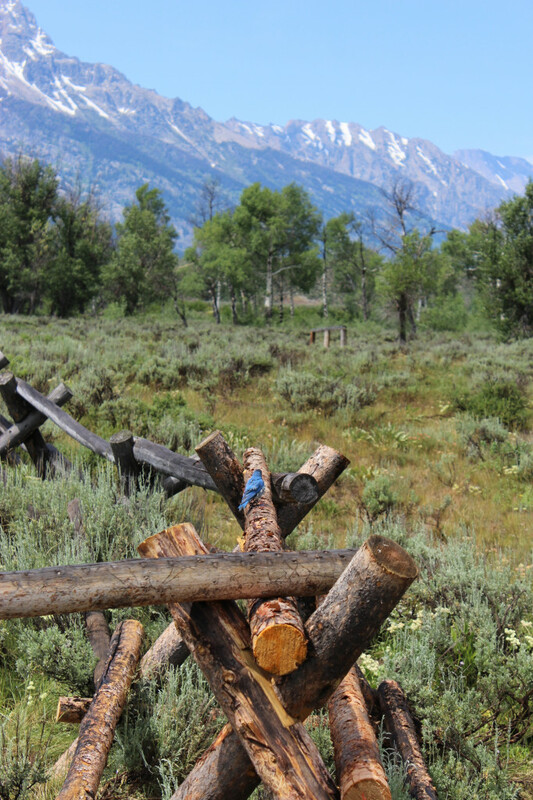 A bright, feathered friend was taking in the Teton views and wasn’t too bothered by us snapping his photo. 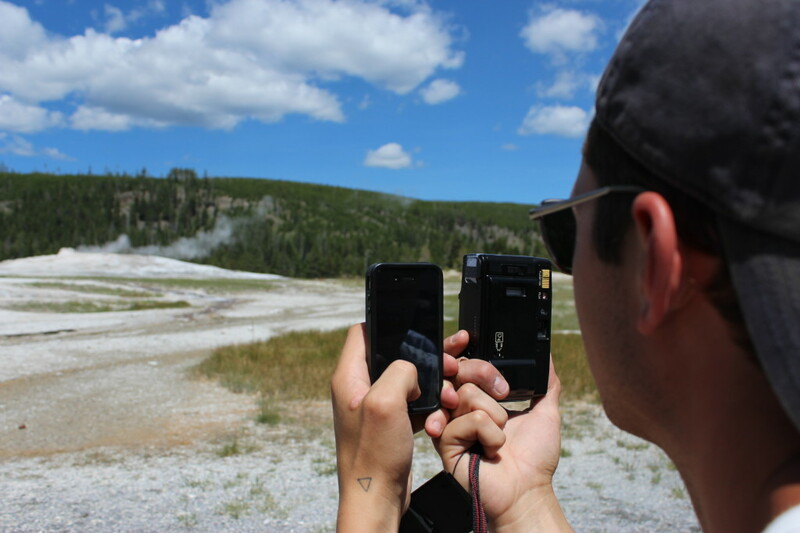 Caught Clark double-weilding, waiting to catch Old Faithful in Yellowstone. 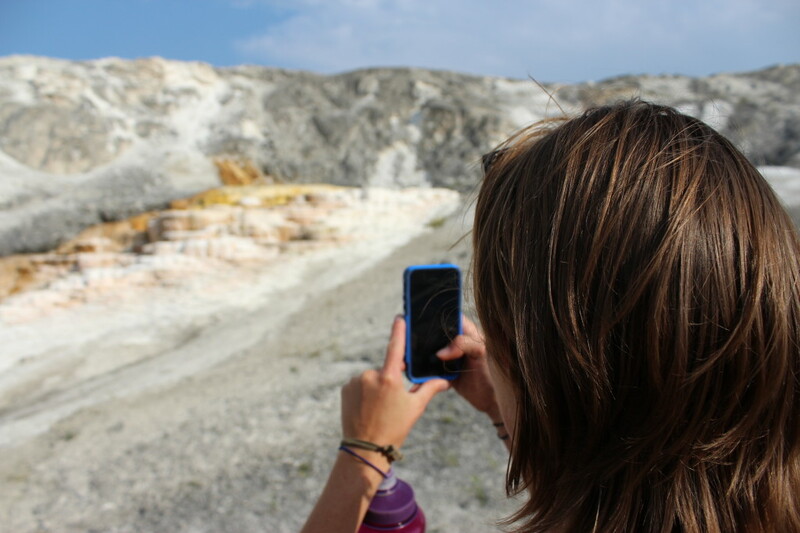 And then Clark caught me snapping away at Mammoth Hot Springs. 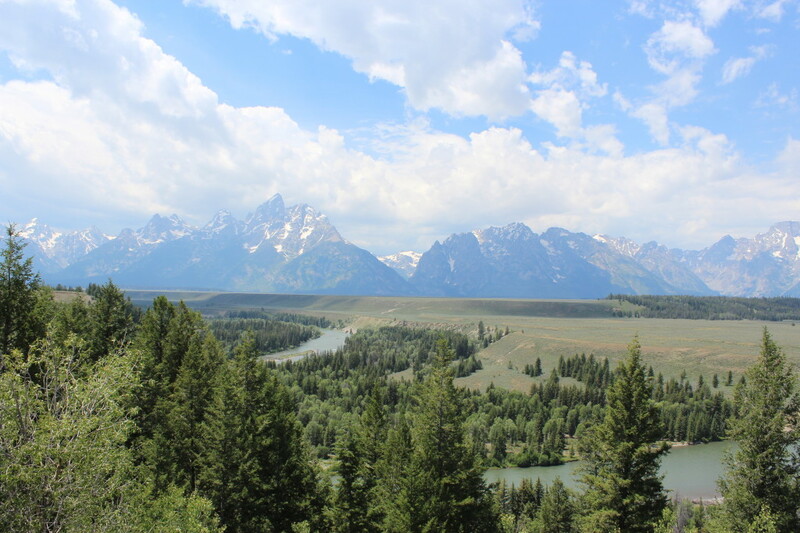 Welcome to Grand Teton National Park. 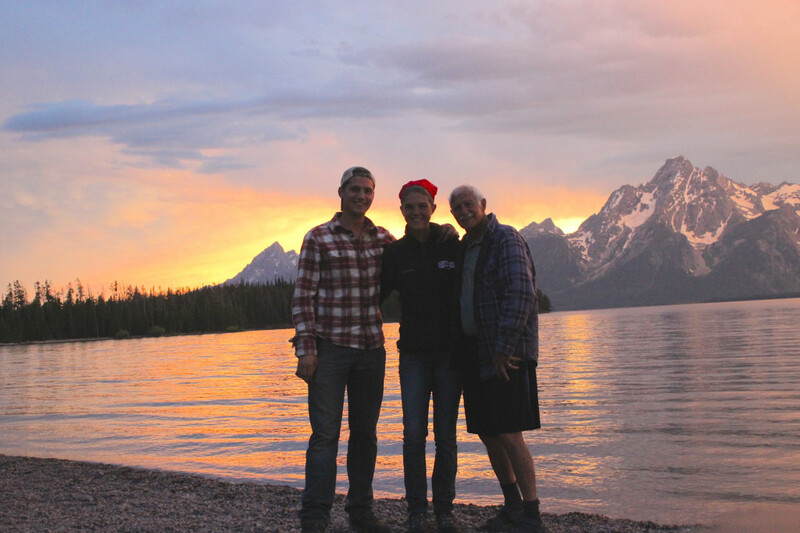 At sunset on Colter Bay, we made friends with Frederick, a South African expat who now calls Utah home. 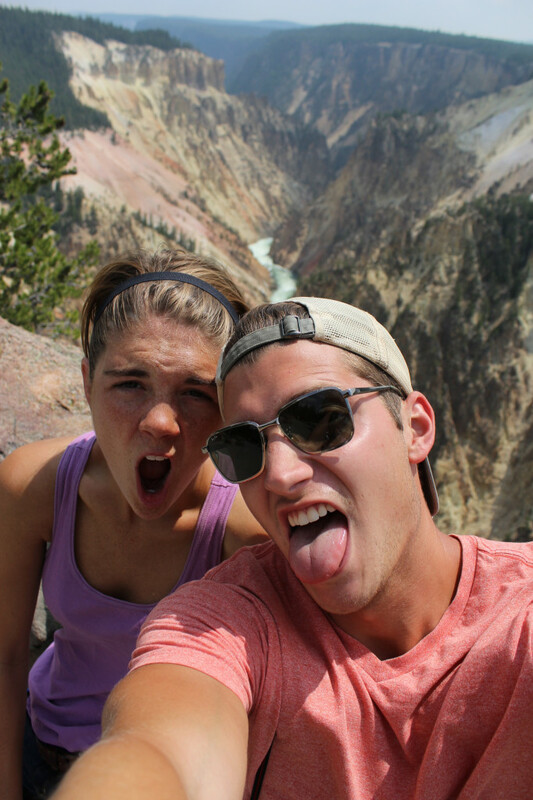 Dizzying views at the top of Yellowstone’s Grand Canyon. Our camp setup outside of Kalispell, MT. 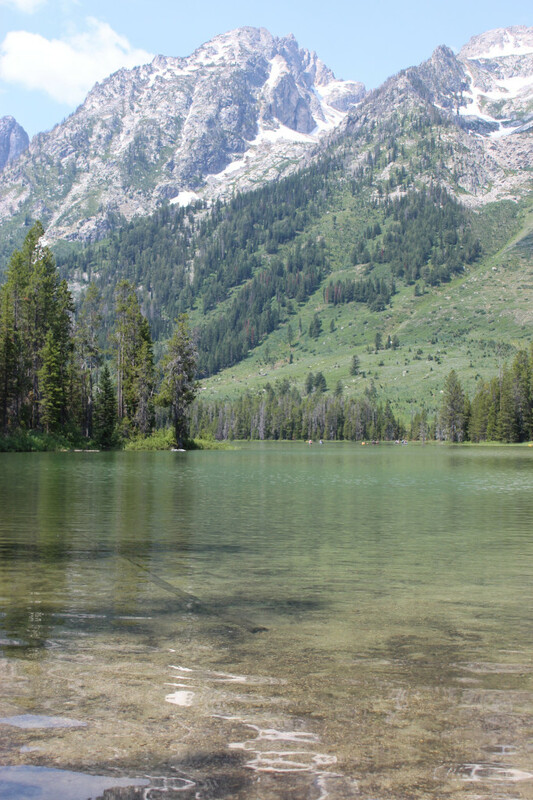 Clear water, blue skies, and infinite greenery in Grand Teton National Park. We woke up like this. But the sunrise was SO worth it. 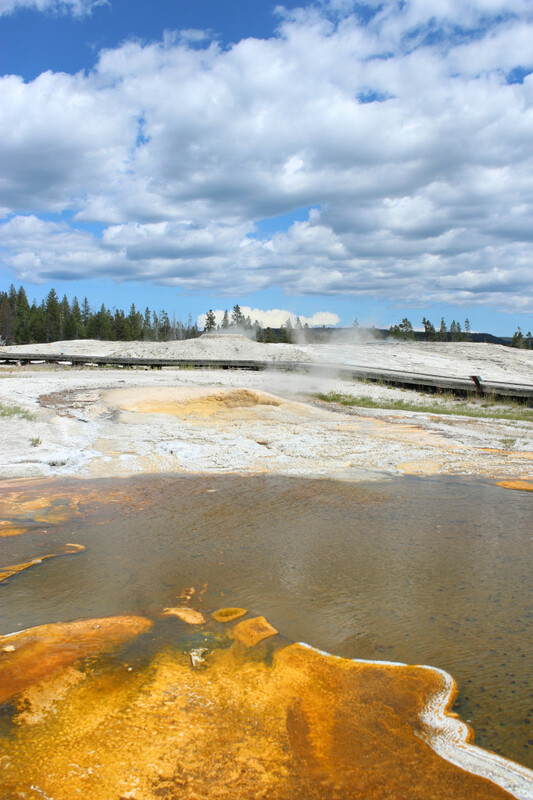 Colors, views, and smells are unparalleled in Yellowstone. Donna got us there and back. Thanks for sharing your vacation, loved reading it. I envy the both of you in your travels. Thanks, Sandy! We appreciate your wishes. :) We feel so lucky to have gone on such a fun trip! This is an adventure. Absolutely love this, you 2 are simply perfect. Wish all the best the world have to offer you both, continued blessings your way!